This week we will focus on Senji Yamamoto(1889-1929）, this progressive politician,labour activist, and biologist who opposed the Peace Preservation Law and was assassinated by an extreme right-winger in 1929. The notorious Peace Preservation Law enabled imprisonment and torture of thousands of progressive scholars, activists and journalists from 1925 to 1945. Yamamoto was from Kyoto and spent five years in Vancouver, out of his short 39 years of life. He is still regarded by a hero by many progressive people in Japan. March 5 this year will be the 80th anniversary of Yamamoto's death. Time: 7:00 PM - whenever the discussion ends. You are welcome to join us for sushi starting at 6 PM. RSVP: info@peacephilosophy.com by morning of February 28. For those who are coming early for sushi, let us know by Friday February 27. We look forward to another evening of mutual learning, sharing, and lots of fun! The Peace Philosophy Salon on February 21, on the birth of Japan's Constitution was a great success. 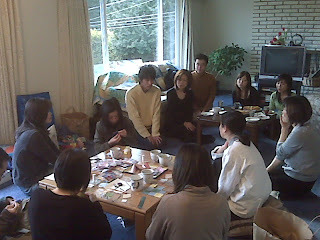 We had 14 people - students and professionals, and with Chinese, Korean, American and Japanese cultural backgrounds. Our discussion topics included Article 9, Self Defense Force, the constitutional revision debate, national referendum, happiness, "Power Over" versus "Power To," nationalism and patriotism in education. Here are excerpts from the comments from some of the participants. "The meeting was very informative for me. I am surprised that the Article 9 doesn't say "in any circumstances" but "preceding paragraph" as we discussed. Still, I believe Japan should never lose it. " H. T.
Following are in comments in Japanese, followed by simple translation. Thank you all and I look forward to seeing all of you again in the next event! This is a report of the February 14 meeting in White Rock, by Kyoko. We had 13 participants on the Valentine Day - thank you! We together made 16 "9-patches" for creating one large quilt for peace. Special thanks to Mihoko, who shared her experience of living and volunteering in Jordan. This Saturday's Peace Philosophy Salon will be about the Constitution of Japan - we will use a video program to learn about multiple organizations and individuals that contributed to the birth of the current Constitution of Japan in 1946, which includes the war-renouncing Article 9, acquired after the hard lesson of a devastating defeat and millions of lives lost in the wars of Asia Pacific. We will have Masa Kagami, a co-chair of Vancouver Save Article 9 with us. This event will be held primarily in Japanese. English speakers are more than welcome and translation will be provided. Time: 7:30 PM - whenever the discussion ends. You are welcome to join us for pizza starting at 6 PM. RSVP: info@peacephilosophy.com by morning of February 21. For those who are coming early for pizza, let us know by Friday February 20. We look forward to this special evening of mutual learning and sharing. Scroll down for an English summary of this meeting. Would you like to participate in the "Quilting for Peace?" You don't need to be able to quilt. I am hopeless in sewing, but even I could do it. All you need to do is to sew 9 patches of cloth together. Why 9? Easy to guess. It is for the Article 9. On Saturday February 14th, we will get together in White Rock and do quilting together and talk about peace. We don't just talk about peace. The process of getting together on the Valentines Day and guilting "9 patches" itself is peace. This time we will welcome Mihoko Yamamoto, a UBC exchange student from Ritsumeikan University (Kyoto, Japan) to join us and talk about her volunteering experience in Jordan. Jordan? What do we know about Jordan? Do not miss this opportunity. Please bring pieces of cloth - old children's clothes, clothes you don't wear any more, etc. And there is no room for sexism in this event. Men and women are all welcome. My article on the play "NABI/Comfort Women" was published in the January edition of Geppo/Bulletin. I have been quiet since my Happy New Year message, and for those of you who know how crazily active I have been for the last four or five years, you may be wondering what's been going on. From February I will organize smaller-scale events for Peace Philosophy Centre and will organize larger events primarily with Vancouver Save Article 9. I will upload 2009 schedule of events soon too.